In the previous Blog Post we connected Dynamic CRM with Xamarin Form application using ADAL authentication and CRM mobile helper library and executed the WhoAmIRequest. In this blog post, we’ll continue with the previous project and retrieve Account records from Dynamic CRM, display them in list view (List-View is used for displaying lists of data) and show details of records in detail page when user taps a record. 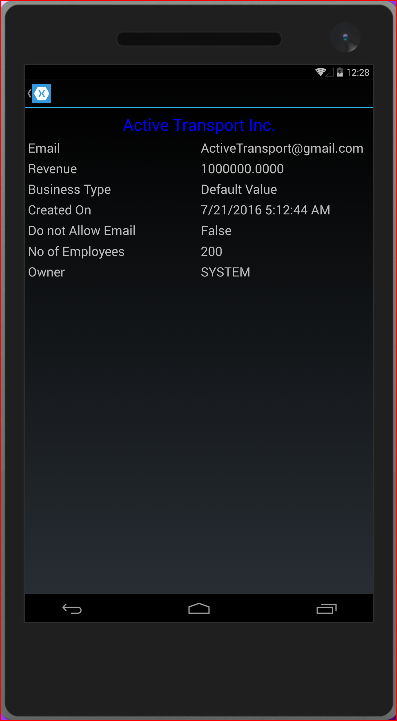 Add Accounts Class to your Portable Project. In this class we will declare the variables for account data as shown below. 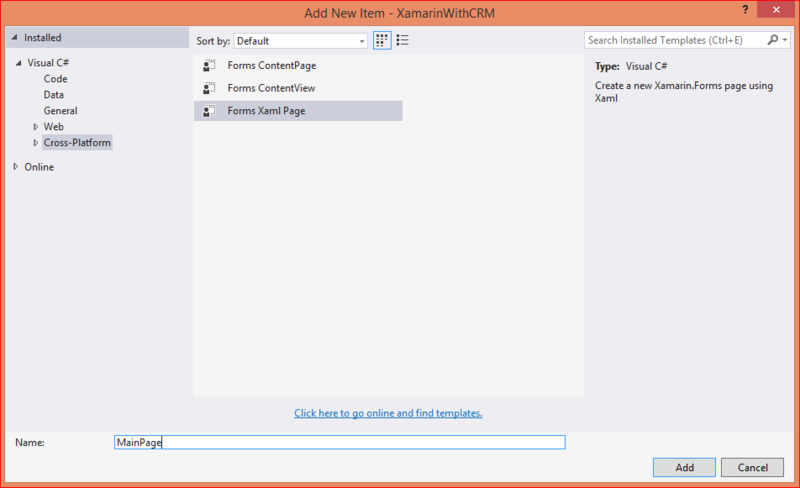 Add a Xaml page to your Portable project. Right Click your portable project, click Add |Add New Item. 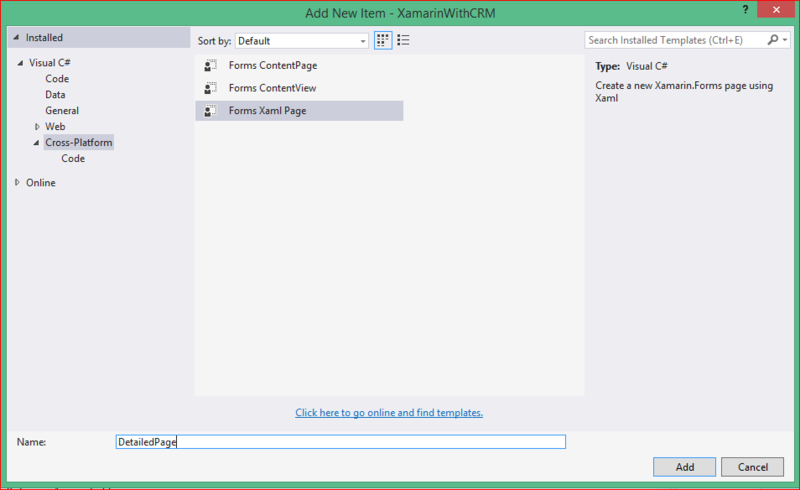 Select “Forms Xaml Page”. Name it “MainPage” and click Add as shown below. Make this page the root page of your application by adding the line shown below to the constructor of App.cs and comment other code in the constructor of App.cs. Add the following code to MainPage.xaml. We shall use ListView. 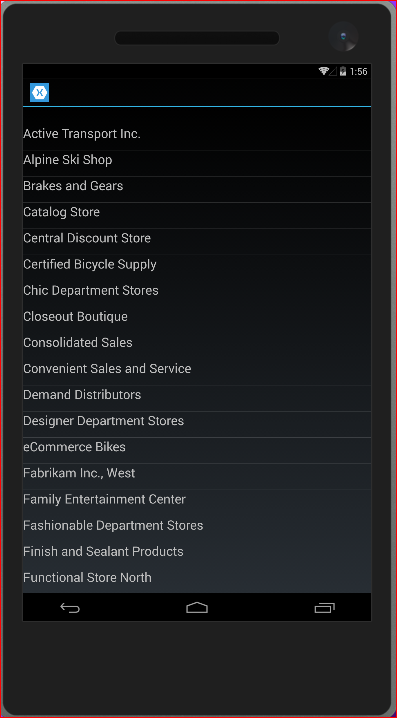 ListView is a view for presenting lists of data, especially long lists that require scrolling. Add the RetrieveAccounts function to MainPage.xaml.cs file. In this function we shall use OrganizationDataWebServiceProxy (defined in Add Microsoft.Crm.Sdk.Mobile sample) to retrieve data from CRM. We shall also use QueryExpression for our query and EntityCollection the result of our query. These terms are defined in Microsoft.Crm.Sdk.Mobile sample. If you want the ListView to automatically update as items are added, you’ll need to use an ObservableCollection. ObservableCollection is defined in System.Collections.ObjectModel and is just like List, except that it can notify ListView of any changes. Create instance of ObservableCollection as shown below. Add the following line to the constructor. ListView is populated with data using the ItemsSource property, which can accept any collection implementing IEnumerable. The definition of RetrieveAccounts is as shown below. And call this function from the MyButton_Clicked method and also make instance and initialize the proxy “OrganizationDataWebServiceProxy”. Execute the application, the list of Accounts will be shown as shown in below screenshot. Add a xaml page and name it “DetailedPage”. In this page we will show the details of the tapped record. Add the following code to the constructor of the “DetailedPage” page. 6. Navigation from list record to detail page. Implement ListView.ItemTapped method in the constructor of the MainPage.xaml.cs. This method will navigate to the detail page when user taps a record. Add the following event to MainPage.xaml.cs. Run the application and result will be shown when a record has been tapped as shown in screenshot below.